Hank Haney is regarded as one of the top golf instructors in the world. Over the course of his career, he has helped over 200 touring professionals and has written four books on golf instruction (as well as 14 instructional DVDs and countless articles for major golf publications). Since starting teaching golf in 1976, Haney has given over 50,000 golf lessons around the world. In addition to mentoring golfers through his golf academy and rigorous teaching schedule, he has also helped coach some of the most successful golfers of the past 30 years. Hank Haney's years of playing and teaching the game have taught him the importance of a good grip in playing better golf. A grip's texture can affect your shot by keeping the club firmly in your hands as you swing. If your club twists or moves during your swing, you're more likely to inadvertently open or close your clubface, resulting in an unwanted slice or hook. Because of this, Hank tries to help his students find a grip that is firm, comfortable, and that works well with their particular swing and technique. Why Hank Haney trusts PURE grips. Having tried hundreds of different grips during his career, Hank Haney knows a thing or two about finding the right grip. What he likes about PURE grips is that they are strong, durable, and stay consistently tacky in all types of weather. 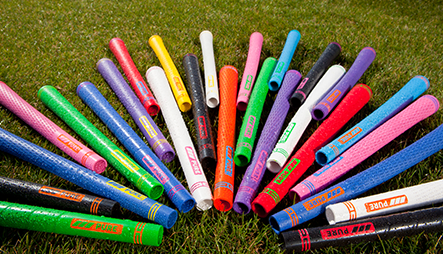 Made using a unique rubber formula and precision molding process, PURE grips offer golfers a greater level of feel and comfort. Because every golfer is different, he appreciates that they are available in a wide range of firmness options so that he can help his students choose the grip that's right for their game. In addition, PURE grips makes it easy for him to custom fit his students using their unique tapeless installation process. As a teacher, I believe that custom fitting the club to the golfer is imperative. Until now, it was hard to get dialed in on the grip, but PURE’s options and the ability to grip, remove and regrip with ease really helps us get a player in the right grip for their game. What really made Hank Haney want to promote PURE grips in his golf schools, teaching academies, and other business ventures is our commitment to quality and our focus on precision manufacturing using only the highest quality materials. Through aggressive research and development and a manufacturing process centered in the United States, we are able to produce golf grips that feature superior feel and comfort, exceptional durability, and easy installation, all at a great value. When you take one of the world's leading golf instructors and pair him with the most advanced golf grips on the market, you're bound to get some amazing results. Whether he's helping his students custom fit their PURE grips for better feel and comfort or promoting our products through various marketing efforts, we're sure that his vast experience and knowledge of the game will be a valuable asset to us as we continue our efforts to help golfers improve their grip and improve their game.